Getting through the job interview, phone screening seems to be tough these days. There are smart candidates who get through and step out for their first face to face interview in an organization. In order to impress the potential employer, the candidate needs to make an extensive research about the organization. Instead of reading through a google research or the latest news page, find out details which can be beneficial to you. The company profile, annual reports, about us section, research and achievements should be glanced through. This quick review and knowledge present the employer that you have an interest in the organization. 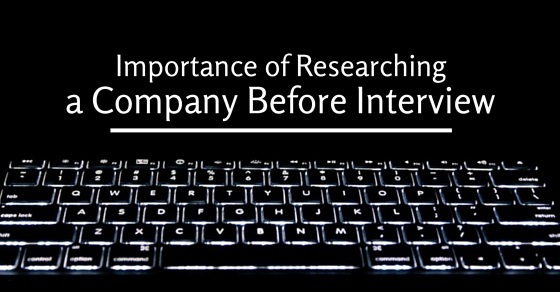 Let’s glimpse through a few tips about the importance of researching a company before an interview and why you should Research a Company before an interview. The following mentioned are few tips on how to research a company before preparing for an interview. The employer’s website is a great place where you can see the company itself. The company’s values are named in the mission statement and hence it is compulsory to learn through it. Also make an association with your position and the mission statement of the company. Your background and experience should also be taken into account which can assist in the company’s goals. Make your mission statement as a discussion rather than parroting it in the interview. By this way it is important to research about company before an interview. To turn the employer’s attention towards the candidate, it is mandatory for the candidate to research the company well before an interview. The candidate should look through the news page of the company which shows the recent news releases. The candidate needs to have a view on the long term implication of the news for the company as well as the candidate and shoot out some possible questions from that zone. The well-informed conversation can be a vital factor that adds value to the interview process. There are search tools present in the company’s website through which you can hunt for ones who are interviewing the candidate. Press releases and bio pages with the latest activity of the company can be found. With this a LinkedIn or web search can be accomplished to do an extensive research about them. By this way the candidate can get a hint or a common ground which can be added as a conversation in the interview. The candidate can mention the professional achievement and pay a compliment to the interviewer. The way to dress for an interview can also be mentioned in the company website. The candidate can also find some pictures of executive team. The candidate can get a hint about how to dress formally from the website too. For the same reason it is mandatory to research the company website before an interview. Another best source who can provide you ample company information is the people who are inside the organization. These people can offer the candidates, an insight on the corporate culture, business profile insight and personality dynamics. A research in LinkedIn can be made to find any contacts. The professional as well as alumni organization can also be researched for contacts in the organization. Friends and relations can also be contacted to know if there is anyone inside the organization. By this way an insight of the prospective employer can be gained. Researching an company before the interview is vital to know the complete history of the company. This can be an added advantage in an interview which enhances your chances of getting recruited. The candidate should research the website and get to know about the trade publications, blogs and general interest publication of the company and employer as a whole. The company’s financial prospects and industry trends should be discussed depending upon the industry and searches made accordingly. It is important to check the social media sites about the company before an interview process as the latest update can be obtained. Twitter can be checked out to find the latest information that is tweeted. LinkedIn is another source which can help you get linked with other employees in the company. The candidate can research and find out the competitors for the company and where they stand in terms of relation with them. The candidate through his research can find out how the company is working in a different manner to the competitors and do they possess any ethics. The information about companies can also get the candidate know if they have any specific targets. By this way the candidate can get to know how the company works differently from others and this can be a good discussion in the interview. By this way chances of getting recruited are high and hence it is important to research about the organization before preparing for the interview. Check the company’s employer reviews, the candidate can find out if there are any testimonials or feedbacks. By this way the company can get a better gauge about the service they offer. Employee reviews are beneficial too as they rate their employers, in that aspect candidates can check out company review sites like glass doors for inner details. By this way you can impress the employer and also have an enhanced vision about the organization. By researching through the company website the candidate can get to know the current events that took place. The person who interviews have chances to mention the recent events to engage the employee in conversation. It is important to research and learn more about the organization before an interview. During an interview session, the candidate should know the important players who hold key positions in an organization. The department directors, managers and CEO are few famed personalities which the candidate should know before going for an interview. When there is a question shot up regarding these important players the candidate can answer in a confident way rather than being puzzled. The news section of the company website can help you gain knowledge about the organization’s latest news, and their achievements. Their future plans and accomplishments can also be read through their website. By knowing such beneficial business information, the candidate can mention that he can also join the team and work for the future projects. The contracts obtained, future projects and lot more can be known by reading through the news part of the company website. To have a view of the future of the company, it is mandatory to research before an interview. By researching a company the employer will get to know that the candidate is interested and knows more about the company. By this way, the candidate also gets an idea of what the actual work is in the organization and learns to take a right decision at time of offer. To get recruited in a standard company it is vital to make a research and find out inner details. The candidate can use the website of the company, other websites and networking to know about the company. The mission statement which sums up the values and goals of the company should be known. The comments, reviews and blogs are other versions to know more about a company or organization. The interview stage and the job offer stage are mandatory phases where research about the company has to be done. Getting a job offer and negotiating the offer can be made possible only after extensive research of the company. By researching a gaining knowledge the interviewer would know that the candidate is serious about getting the job and it reflects well on the candidate. By researching, the candidate can know what the company is and what she expects from them which help her take a decision. Candidates who are getting ready for an interview can glimpse through these points to know the importance of researching a company before an interview. There are a number of websites and the company website is mandatory to research and hunt through to gain more knowledge. The interview process is made simple and the candidate is made confident by making extensive research about the company. By this way, he is able to learn more about the company and pass the interview without anxiety or fear.